very easy to make but yet still resulted very good sponge cake.. I was impressed with the quality of this plastic mould, so easy to remove the cake from the mould !! 2. Brush the mold with some cooking oil, fill bottom of the mold with shredded coconut. 3. Stack 2 mold together and press till shredded coconut is firmed. 5. Beat sugar, eggs and ovalette until fluffy. 7. Slowly add in flour and mix till well combine, add in colouring. 8. Fill the sponge cake mold with batter till full. 10. When cake turned slightly cool, remove the cake from the mold. Serve with coffee or tea. I have been receiving many readers asking me where to buy this and that. I try to provide them with the shop address but some couldn't go there because the distance or not familiar with the area. Sometime i help to buy for them. ..So i came out with this idea of My Kedai Runcit (shop) I will help to source of the baking items, traditional moulds or whatever items or ingredients that you have seen in my blog. I will pack them and ship to you and you pay for the shipping cost..I know i will not earn much out of this (that's why i called my shop as kedai runcit, earning few cents and ringgit only ^_^), but i just like to help to who has the same passion like me (love to cook and bake!!).. Please refer to top right page for My Kedai Runcit..Oversea buyers are welcome too, but you need to consider of the shipping cost (afraid the shipping cost is more than items cost) before you decide to place an order.. I have discontinued My Kedai Runcit, kindly take note.. I love this Malay steamed cake, u have done it beautifully Sonia. Congrats on the opening of ur new shop! Very beautiful! I bought these moulds a few years back but have yet to try making this sponge cake yet, ha ha.. I have been a lurker of your blog for over a year and really amazed at your cooking skills. I am going to try several of your recipes and will definitely use your "shopping service" which I am excited about. I am oversea (US) and aware of the shipping cost. Thank you for starting the service and please keep cooking and posting it for all of us to enjoy. Not too long ago my staff gave me some of this cake to sample. They were really good but I was too shy to ask for recipe. You make my dream come true! Also your shop is a great idea. I may buy some stuff form you. 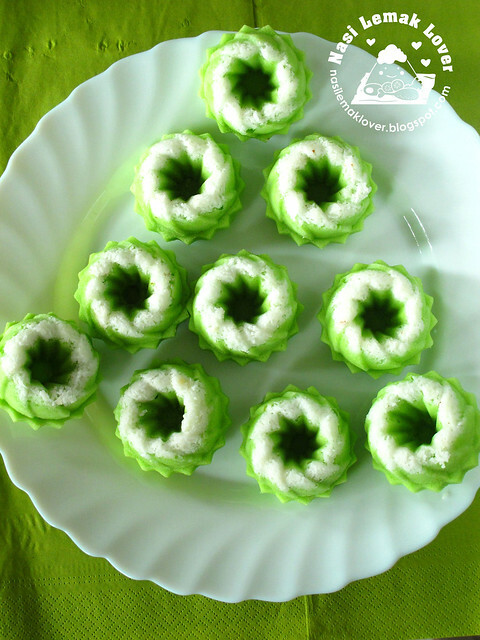 Lovely kuih, Sonia! Have not eaten this in ages! Congratulations on your Kedai Runcit! Congratulations on launching of your kedai runcit. I want to place my 1st order. The roast pork skewer. I will collect from you when I see you on the 24/6. I had this puteri ayu plastic mould months ago (given by Jane) because that time I told her I want to make this after seeing 茄子‘s recipe。 Thanks for reminding me. This recipe will come into my list to do again haha! Aiyo click the send button too quick. I want to say your puteri ayu looks so beautiful thats why I have to make this back into my list. 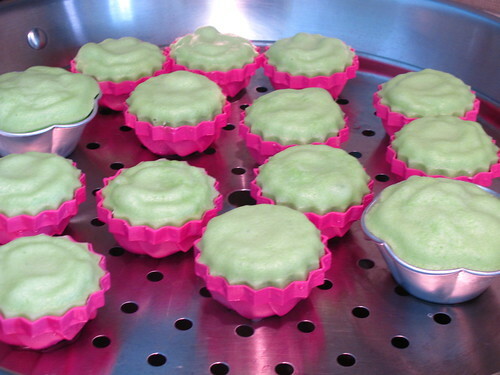 These are very delicious kuih that I love very much. Looks so beautiful n yummy,loved the color simply superb!! Sonia, congrats first. Haven't tried making this puteri ayu. Will try yours. Will also watch out for your 'kedai runcit' items. Very thoughtful of you to come up with this idea. your puteri ayu so beautiful. Love your idea of setting up the shop. Would be a great help to those overseas and locals. Never know it may grow bigger with bulk purchase. Anyway, thanks for your gift. I'll always remember it. The cake looks so good, I will have to try making it. Maybe I'll make a super big one to satisfy my craving. Love the green! So pretty and I bet it taste as good as it looks. ;)) btw, great idea on this oine bakeware shop thing, I'm sure it'll be a hit! 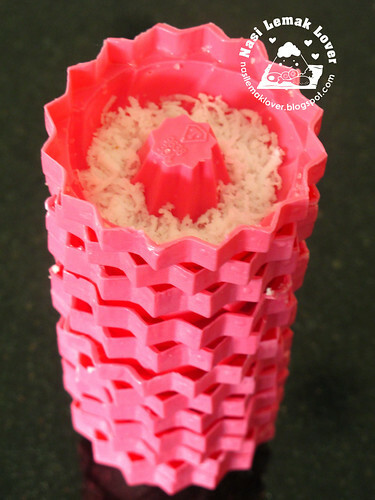 Btw, do u know where to get castellated mould on your side? If yes, I want to order, lol! Sonia mon amie, merci pour cette recette. J'ai des moules identiques et je vais pouvoir les tester avec cette recette. Je vais visiter ta boutique. Une idée généreuse et géniale. Gorgeous! Even the mini moulds look beautiful! I love the contrast of colours. 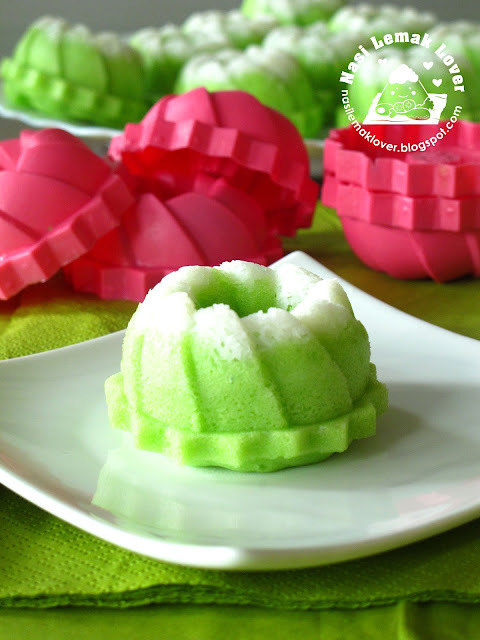 I really must make a pandan cake one day. like you, i also dont know these mould are mainly used for making these puteri ayu. What a fantastic and thoughtful idea of your kedai runcit!! This little cakes must be soft and delicious. Good to have a "Kedai Runcit" so we can browse around too. Good for you Sonia and many thanks for your kindness. Yessss.....i looking this recipe, thank you so much...must try during this holiday!! Hi Sonia, your puteri ayu look very pretty, lovely green color. Thanks for trying out the recipe, yours look very good. Congrats on your new online shop , I'm sure it will be a success ! Congrats on the opening of your "new shop". Your Puteri Ayu look so lovely. 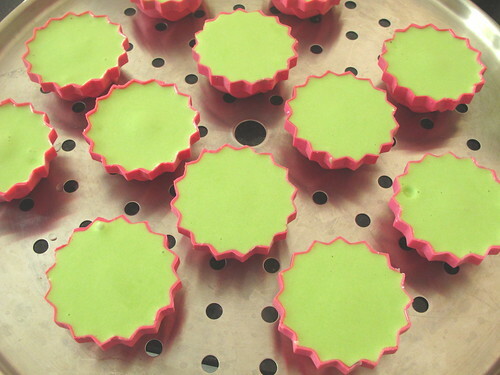 Love the colour of the Kuih too. A very nice green colour. malay steam cake right.. i like it..
Sonia, you really need a rest now b4 the biz starts! I certainly believe that you are not doing this for money & you cook.bake is purely due to the interest! I'm so glad to know someone like you, hahaha! Hey these mini bundt moulds look so familiar, gagaga! That's right, I remember you told me b4 that they can be used for making jelly only & now I can use them for steaming sponge cake, brilliant! 1 question, Sonia, if I can't find cake emulsier(& don't want to use it), what should I be using as a substitute? Jessie, you can read my mind, hehehe..I also thinking to omit the emulsier next time to see the difference, so for this moment I could not tell you yet. looks gorgeous! i like the softness of steamed cakes, and it just reminds me of those traditional delights from home. this is one recipe I really would love to try. they look so pretty! These are beautiful. I love the pretty shapes. I love these too, i used to buy these which come in a box from Nyonya Colour cafe which served all types of local kueh and delicacies,at Mid Valley, haha, now can make my own finally. What a brillant idea- congratulations. You are truly so helpful and generous with your recipes and now your time! congratulation on your opening of my kedai runcit!! 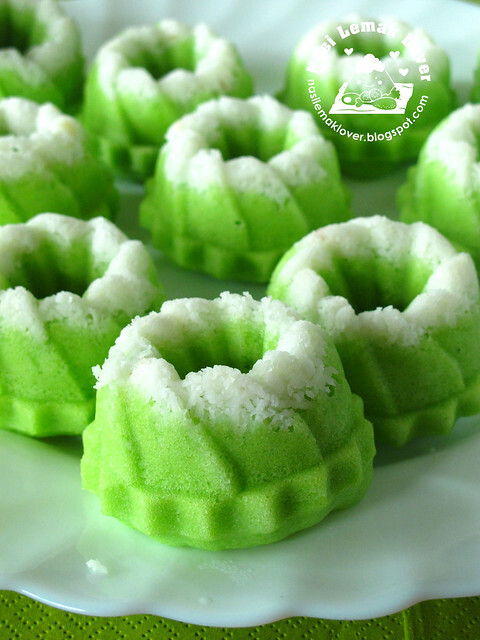 It's really a good idea for you to have some fun beside making some RM..
recipe when I rajin to make this kuih!! lol! thanks in advance! oh dear, I am not sure whether I have tried this cake before!! And good idea on the shop!!! I'm off to hv a look. The sponge cakes are so beautifully done !! And hope the business for your shop will thrive ! Very well done for setting up your own business Sonia, hope you will do well and be very successful!! congrats on your new business, wishing it sweet success! your mini cakes are beautiful. 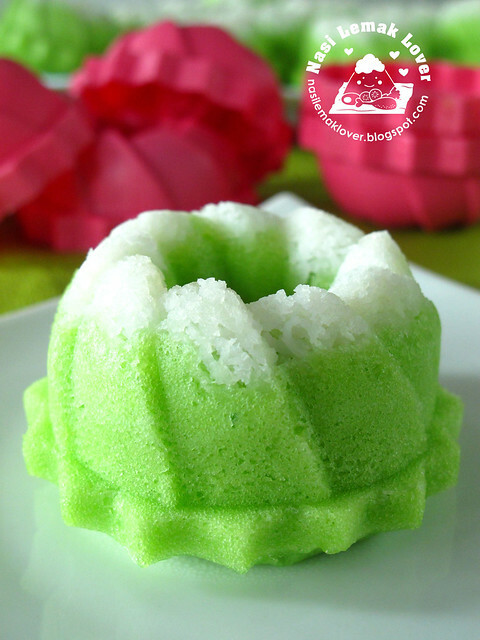 I came across your blog and found your lovely pandan cake. I live in Malaysia currently and see these cakes quite often. 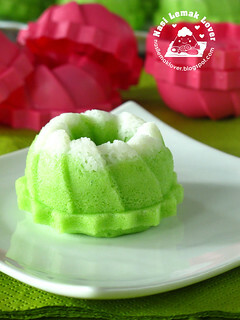 I love the pandan flavor in the cake and the steaming makes it so soft and moist. Beautiful shade of green, too. Thanks for sharing. Whoa Sonia, this is no jokes! You 're providing kedai runcit services too. haha... Kudos! Your readers must be so lucky to have you to do all the jobs. of coz, including ME! haha....Love that kuih. I bought those moulds long ago but have yet tried this recipe. Will soon. Hope you're having a great day, dear. Never tried this kuih before but it looks too beautiful to eat! Hope your Kedai Runcit goes well. Congrats on your new shop. This mini cakes look so pretty and I am sure they taste good as well. May I ask what is ovelette? And how much to use? I just came back from a trip to Penang and I picked up this mold at a kitchen supply store - I had never heard of this dessert but I knew it was something different and unique I wouldn't be able to find here in NY. I always like trying new things - thx for the recipe - can't wait to try it! I finally tried these today and they came out so delicious - thx again for the recipe!